Even though the call for papers had resulted in a number of interesting proposals for presentations, it was decided to make an additional sweep and extend the time for more contribution proposals fitting this year´s theme: “Transformation as Stability: Audiovisual Archives in the Era of New Media”. The board agenda included an item on changing the Bylaws concerning voting procedures at general meetings. Tedd Urnes, Teddview Audiovisual Archival Management, Norway argued that there must be better opportunities for those parts of the membership who are not able to always attend the general meetings and to take part in the decision-making of the organization. This could be made through voting electronically and that candidates to BAAC offices are presented on the website beforehand. This is one way of feeding more interest into the necessary organizational work of BAAC. At the same time it will make the procedure of proxy voting unnecessary. announcement of general meetings and decisions by majority not to paralyze organizational activities due to unreasonable formalities. The BAAC board will have to return to the upcoming general meeting with a proposal for the membership to consider reformed bylaws on these matters which were raised by Tedd and Lars-Gunnar. Concerning the co-operational activities paragraph, which especially deals with the matter of exchanging consultants between member organizations, see the presentation by Lars-Gunnar Bengtsson, SVT Syd, Sweden below and his remarks. In the BAAC, a tradition, more or less, has developed, whereby, during board meetings, a mini-seminar or conference, is also arranged. This time was no exception. Our board member Aldis Putelis, working with the host of this meeting, came up with the idea of putting special emphasis on stills collections as a theme. That also became the heading for this seminar: “Collections of Still Images at Institutional Archives: Protection and Accessibility”. For those of us not so familiar with living under the conditions of Soviet occupation, it is difficult not to be influenced by the very architecture of the building housing our host. I guess, like its counterpart of a much more brutal size in Warsaw, Poland, the building once was called something like “A gift from the Soviet liberators to the Latvian People”. The style is referred to as Stalin’s Socialist Classicism and is said to modeled after Rockefeller Center in New York - to represent the optimism for the future. Probably a kind of present you couldn´t refuse in “the good old days”! It is impossible not to feel the impact of such architecture. Then an ever present reminder of foreign occupation, today of the fact that empires sooner or later fall. It’s important also to “archive” architecture. If you are the least interested in architecture, Riga is really the place to go. The Baltic Hanseatic imprint on the city is certainly there, side by side with Russian 20th century “baroque”, the great number of exclusive art nouveau buildings, the drab Soviet time housing areas and the futuristic architecture of the new Latvia. It’s all there for you! Check out some impressions at the end of this report. “paper archive”, with photo collections added in the early 1950`s as an important step. The second important step is marked by the entry of digital photography. Aldis confronted us with the long list of issues involved in image archiving; from the problems of preservation, copies for reuse, documentation and the numerous formats to deal with (prints in albums, negatives, slides etc.). He referred to this material expressively as “the contents of the shelves” and gave us some pros and cons with original collections in albums as an example. The presentation also included a thorough description of the steps on what to collect and how, structure of description of collected data, tech-nical solutions and standards etc. Juozas Markauskas, Dizi, Lithuania described a theatre poster digitization project, including project planning, image capturing and digital file storage solutions, as well as public and private sector cooperation possibilities. The Lithuanian Theatre, Music and Cinema Museum, are located in Vilnius and hold collections of concert photographs, theatre productions and films. There are also collections of programs, posters, costumes, scenery sketches, models, puppets, stage sets, documents and musical instruments. You also find the personal possessions of famous actors and actresses, as well as directors and musicians, their portraits, manuscripts and ex-libris. 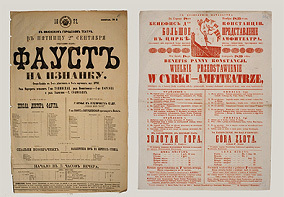 The museum holds a collection of about 2000 posters from the 19th Century, mainly advertising plays performed at Vilnius Theatre and a few Circus shows at Vilnius. As old paper artifacts, extremely fragile and thus not for broader public use. These were the key factors for the decision to digitize the collection. The posters very directly reflect the political status of the area during different eras. See the examples here. Poster on the left is dated back to 1879 and it is written in the Russian language (Tsarist occupation). The poster to the right is from year 1839 and it advertises a circus show. Text is written in Polish and Russian. The Museum has no in-house human and technical resources for digitization. That’s why the method of private partnership for most services was chosen. Shared responsibilities include development of project strategy and tasks schedule. 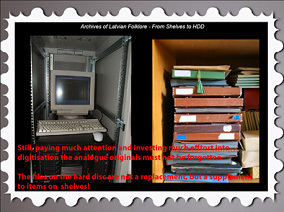 The museum was responsible for restoration of analogue material before digitization. Private partners carried out the digitization process, including development of a database for digital files and metadata, and their presentation on the Internet. The documentation of digital materials is again the responsibility of the museum. All posters are digitized and stored in a specially designed database. The files come in two formats: master non-compressed for archival storage (NEF format), and compressed for on screen viewing and search (JPEG format). The description is stored in a third file format, XML, using the Dublin Core scheme. The digital posters collection will be available at local museum intranet sites. The database of metadata and low-resolution images will be available on the Internet. Ivi Tomingas of the Estonian Film Archives delivered a vivid description on how to start up the digitization process of a huge stills collection though short on resources: “The experience of the Estonian Film Archives: How to digitize photos”. The core message was really the thorough planning of the project and also not to hesitate about “unconventional” solutions like mixing in service to external customers just to get started, gather experience and supporting your budget. The digitization project started in 2001 in cooperation with the external company OÜ Reprokeskus. Later new technical equipment was added to the project. In 2004, scanning with metadata was implemented and 2007 the collection now holds 25.000 digital images. The main principle for the project: Production of digital images as usage copies, not for preservation. Still to establish: A solution for digital preservation and a database. It was especially interesting to hear about the demand by external customers of stills material with sometimes much unexpected themes. The contribution of Vilnis Auzins, “Motivation of Structure of the Archives of Latvian Museum of Photography and its Problem” was cancelled. Lars-Gunnar Bengtsson represented probably the largest stills collection “present” at the seminar, and he had wanted to present it on-line, to show the features of the system for searching the collection, as well as the actual uniqueness of it, when it comes to Baltic material. But this time, for some strange reason, as it happens only at conferences, we didn’t have the technique well in hand. Not as streamlined and flashy as expected, but interesting, Lars-Gunnar started picturing the SVT Bild Collection covering international press photos from all over the world (1920-1965)and the steady influx of stills from the SVT programming of today. The latter of course was digital format, while the greater part of the rest (ca. 5 million prints), are still in the process of being digitized. 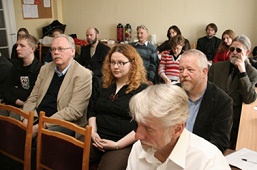 The emphasis of his presentation was, of course, on the vast presence of Baltic heritage material in the collection. - We might have a vast material on the Baltic states, but the value of it varies due to lack of documentation on what we actually have. And I have talked to other archives on this matter and found out that they have very much the same problem. I guess that goes for Baltic collections on for example Sweden as well. His conclusion was what the BAAC board now is working for an exchange of staff between archives to help each other on this matter, and at the same time establish a network of knowledge on what we actually have in our respective archive. - Such an exchange will boost the use of archives both for better TV-programming and scholarly research, finished Lars-Gunnar. The heading of Jûri Karm´s (Estonian National Museum) presentation may have concealed the revolutionary message of it: “Photographic Collections Today. Tomorrow?” He put the light on the ever present problem of an authorized system for documenting stills collections, not only for a national level but regardless of language. In his work for a “common language” he could point at the problems where national languages “play games” with us in our efforts to find the exact parallel level of meaning of a certain term. In one language a term could mean process, when in another it means an action. There is still a lot to do in this field, but since each term in the end will be represented by a unique numerical code, in a hierarchical system, it will give us the possibility to find stills and research collections regardless of language. This is an extremely promising project for the future use of still collections, in particular audiovisual archives. Finally Sulev Sepp of Estonian Multiservice Network rounded off the seminar by one of his vivid and entertaining “one man shows” on the theme, “Who is Who in Archive”, trying to clarify the importance of being aware of the relations between customers, management and the archive workforce.